John Singletary, a fine art photographer and multimedia artist based in Philadelphia is currently exhibiting some of his latest photographs at the James Oliver Gallery at 723 Chestnut Street in Philadelphia as part of a multi-media exhibit he directed, involving photography, dance, music, set and costume designs. The event, entitled Anahata, is running from May 6th through June 9th, 2017. 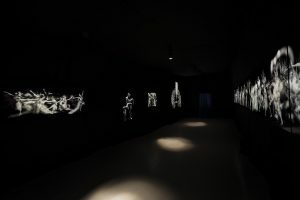 The photographic art is displayed in a dark room on multiple OLED panels installed on opposite black covered walls, creating an immersive experience. John Singletary hired ISFTV’s Kevin Miller to professionally calibrate and match 15 of LG 55B6 and 65B6 panels used as electronic canvases to showcase the print work. 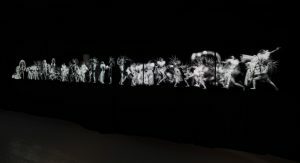 The animated installation includes six 65-inch LGB6 OLED panels displayed on one wall, side by side, in a horizontal configuration like a fresco, and on the opposite wall, two stand-alone 65-inch LG B6 OLED panels, as well as one 55-inch stand-alone LGB6 OLED panel, and a video wall of six 55-inch LG 55B6 vertically arrayed, forming 8’x8’ luminous squares. 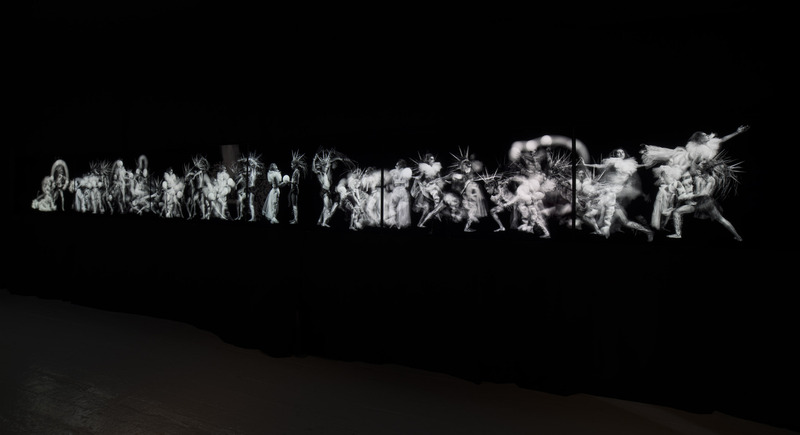 The panels are synchronized and are switching from full illumination to fade to black, suggesting a series of apparitions. Since the photographs are all black and white, we calibrated all the panels to the E5400 standard, which is the color temperature of carbon arc lamp based film projectors from the black and white film era.Light output was matched at 335 cd/m2 or nits, which is about 95 fL., which would normally be quite a bit brighter than necessary for a dark room environment for home theater purposes. However, the fact that it was black and white material, with more black than white, the images did not appear to be too bright. The high light output combined with the OLED’s best in class black level performance also maximized the contrast ratio of the images. The gamma was set to 2.2, which yielded gamma curves ranging from 2.1 to 2.2., revealing all the low level shadow detail that John expected to see in his work whereas the B.T. 1886 and 2.4 gamma settings both appeared to crush some of the detail in the photographs. All the panels were setup utilizing the Expert Dark picture mode, which was then locked and turned into the ISF Night mode. After the initial calibration to the black and white standard, Kevin worked with John to minimize any perceptual differences between the panels by carefully comparing panels, and making some minor tweaks to the grayscale controls to more closely match all of the panels. The use of OLED technology is uniquely satisfying for the viewing of this photographic artwork as OLED displays reveal more depth and far better black levels and contrast ratio than any LED LCD based display would. The black and white photo exhibit taking place in a dark room enables the audience to be totally immersed and be part of this impressive multi-media experience. John Singletary was trained at Drexel University and the University of the Arts. His work is featured at The Philadelphia Museum of Art, The Center for Fine Art Photography in Fort Collins, CO., The Free Library of Philadelphia, and at The Cultural Council of Cortland County, Cortland, NY.